Just two weeks ago, Brazilian President Luiz Inácio Lula da Silva said between delirious sobs in Copenhagen that the International Olympic Committee's decision to award the 2016 Olympic Games to Rio de Janeiro was a vindication of Brazil's social and economic advances. But the elephant in the room was the precarious security situation in the once great city, now fallen into decay, and that elephant made its presence felt on Oct. 17. At least 14 people were killed and eight more were injured after violent shoot-outs between rival drug gangs careened out of the favela slums and into neighboring communities. In the most spectacular incident, three officers were killed after gangsters shot down a police helicopter. The day of violence  a school got hit in the cross fire and more than 10 buses were torched  has underscored the challenge of creating a secure environment for hundreds of thousands of foreign tourists in a state where close to 6,000 people are killed each year, more than 1,000 of them by police. The homicide rate in Rio had been falling in recent years, but it is on the rise again. And authorities, acutely aware that last weekend's violence occurred in the Olympic spotlight, didn't sound exactly reassuring. 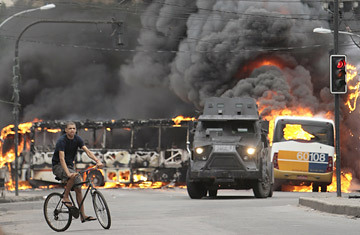 "We told the International Olympic Committee that this is not easy, and they know that," Rio Governor Sergio Cabral said. "We don't want just to be ready for special days  for that we can put 40,000 police on the streets. I told them we want to get to 2016 and have a peaceful Rio de Janeiro before, during and after the Games." Recent attempts at community policing in at least two favelas, including one in the heart of the touristy South Side, have given Cabral some grounds for optimism. By stationing officers inside the community rather than just storming it at the first signs of trouble, police have gained a measure of confidence and credibility among residents. But the program has been limited, and the task ahead remains enormous. Out of Rio's more than 1,000 favelas, the so-called Pacifier Police Divisions have been introduced in just four  authorities lack either the resources or the manpower to implement them all across the city, and they have resisted root-and-branch reforms of police forces that are unprofessional, corrupt, poorly paid and poorly armed in comparison to the drug gangs they face. Some previous attempts at community policing went wrong after residents accused officers of the same corrupt practices that are endemic throughout Brazil's police forces. This time around, authorities are hiring rookie cops to avoid the bad habits of veterans and paying them bonuses in the hopes that they won't resort to accepting bribes. "It is a genuine attempt to change the way policing is done, but it will take a generation to make a start, not one or five or 10 years," says Tom Phillips, co-director of Dancing with the Devil, a new film about traffickers and cops in a Rio favela. "But resources are stretched, and they are doing it in just a handful of communities out of a thousand. If they tried doing it in 20 or 50, then they'd do a bad job in all of them." But if Rio's local government can at least claim to be conscious of the challenge, the same cannot be said for the IOC and FIFA, international soccer's governing body, which chose Brazil as the host of the 2014 World Cup. Delegates awarded Rio the Olympics for legitimate reasons, and no soccer fan would argue that the city's legendary Maracana Stadium does not deserve to host the World Cup. But both organizations sidestepped the problem of law enforcement and ensuring the safety of the hundreds of thousands of foreigners who are expected at those events. The final IOC report made little mention of the security situation other than to euphemistically note that the city "faces public security challenges." FIFA, for its part, declared that Brazil's "authorities have the know-how and resources to improve the situation before 2014, and would have the determination to manage it during the 2014 FIFA World Cup." Before the Games and the World Cup were awarded, Rio officials played down the security angle, and they were delighted at the willingness of the IOC and FIFA to turn a blind eye to the problem. Now, though, they are the ones who are left to deal with the problem. Last weekend was a reminder that, tough as it may be to meet the tight schedule for building the stadiums and the public-transportation infrastructure that is required to host these events, that may turn out to be the easy part.